A few weeks ago I spent some time in the Texas Hill Country north of Llano. The wildflowers of red and gold covered the fields and I looked forward to a week or two of photographic opportunities. Firewheels were abundant, bitterweed (sweet yellow) were mixed in, and coreopsis (yellow) were beginning to bloom, as well. And then El Nino kicked in. I haven’t returned to this area since early May because it has been rainy and cloudy every day – 10 straight days, I think. 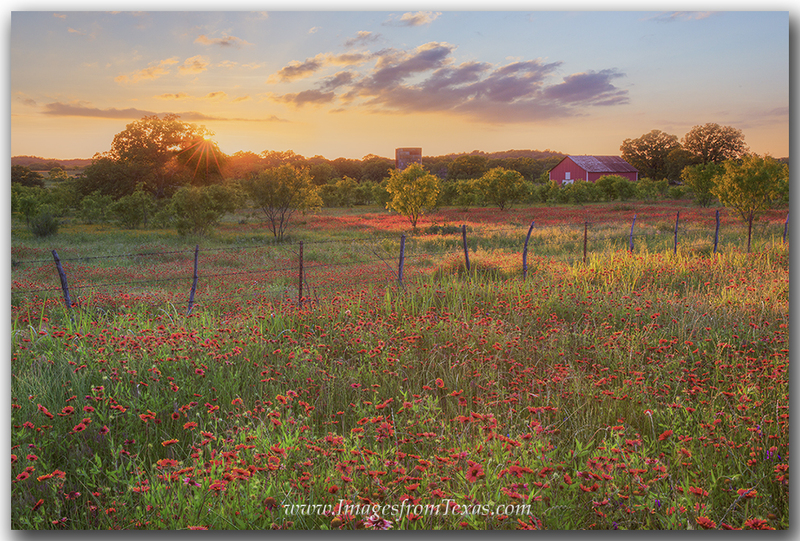 My new wildflower images are posted on my website in this Texas wildflower gallery. Here is one landscape from that area. The light was getting long in the evening and the reds of firewheels filled the pasture in front of a red barn. Evening falls across a field of firewheels in the Texas Hill Country. With the continuous rain over the last few weeks, I revisited a few of my Austin photos. One that I really like comes from the pool near the Long Center. I know some folks like black and white and some prefer color. I really like both. This black and white image is a panorama taken about 40 minutes before sunrise. Fog drifted through the downtown area, and everything was still. 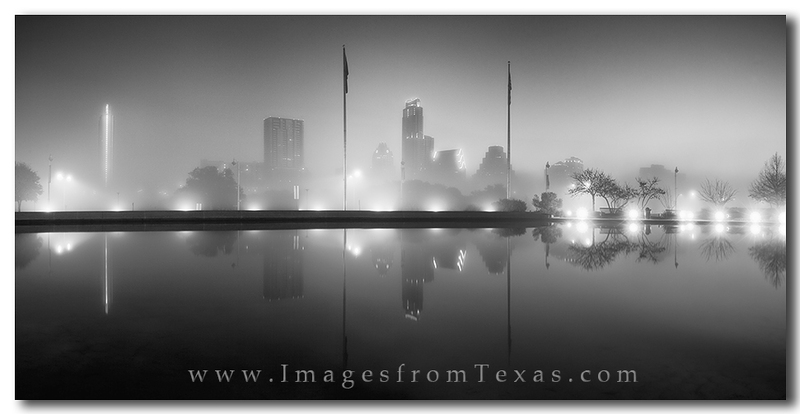 The Austin skyline in black and white sleeps in the early morning fog. In the next year, I hope to start offering more one-day photo workshops, but limiting it to just a few people. This is in the plans, and I’d like to use the Texas Hill Country as a base. We’ll see what happens with that, but stay tuned for details. Thanks for reading. Have a good week, everyone.